Is dietary fiber a good or a bad thing for pigs? Milena Saqui-Salces’ team has observed that feeding diets containing common high-fiber feed ingredients increases the production of mucin. Feeding diets with high-fiber ingredients is an approach to reduce cost of producing pork. However, there are also multiple negative consequences of feeding high-fiber feed ingredients to pigs, and overcoming these challenges is complicated. Recent articles on NationalHogFarmer.com describe various effects of feeding high-fiber feed ingredients to pigs. Perhaps the best-defined drawback is that energy from fiber is less than protein, starch and lipids. In addition, dietary fiber reduces the digestibility of other nutritional components of the diet and increases endogenous losses of amino acids, specially threonine. These negative factors, along with reductions in carcass yield, have been deterrents for using significant amounts of high-fiber ingredients in nursery and growing-finishing pig diets. In contrast, feeding some types of high-fiber ingredients have beneficial effects on growth performance and health of pigs. These effects are commonly attributed to specific types of fiber having prebiotic effects in pigs in all stages of production, altering the intestinal microbiota, and improving recovery from disease challenges in young pigs. This dichotomy suggests that there are multiple negative and positive roles of feeding high-fiber diets to swine, but there is limited information of the underlying mechanisms that contribute to these responses. Therefore, it is important to understand the interaction between fiber composition (non-starch polysaccharides), physicochemical properties of various types of fiber, and the gastrointestinal tract function to optimize its use for improving growth, reproduction and health of pigs. However, much of what is known about the physiological properties of fiber has been obtained from feeding purified sources of fiber to pigs, which is not done in commercial production conditions, and limits the interpretation of results. Therefore, understanding various types and amounts of fiber, and their interactions with other nutrients in natural feed ingredients is necessary. The Integrated Animal Systems Biology team at the University of Minnesota has started to determine the mechanisms of how dietary fiber induces changes in important components of the gastrointestinal tract such as cell composition and immune function. Milena Saqui-Salces’ team has observed that feeding diets containing common high-fiber feed ingredients increases the production of mucin. Mucin secreted by goblet cells is important for protecting the gastrointestinal tract from mechanical stress and pathogen colonization. Interestingly, not all sources of dietary fiber changed the presence of goblet cells (measured as percent of area in the tissue occupied by goblet cells) in the ileum of pigs. An insoluble and low fermentable source of dietary fiber such as wheat straw (diet with 24% NDF) had the greatest impact on goblet cells, while feeding a highly insoluble and highly fermentable fiber like soybean hulls (8.5% NDF) had less impact on goblet cell area. In a separate experiment, growing pigs were fed diets with NDF levels of 8.6% in corn-soybean meal and 17% NDF from either distillers’ dried grains with solubles or wheat middlings. 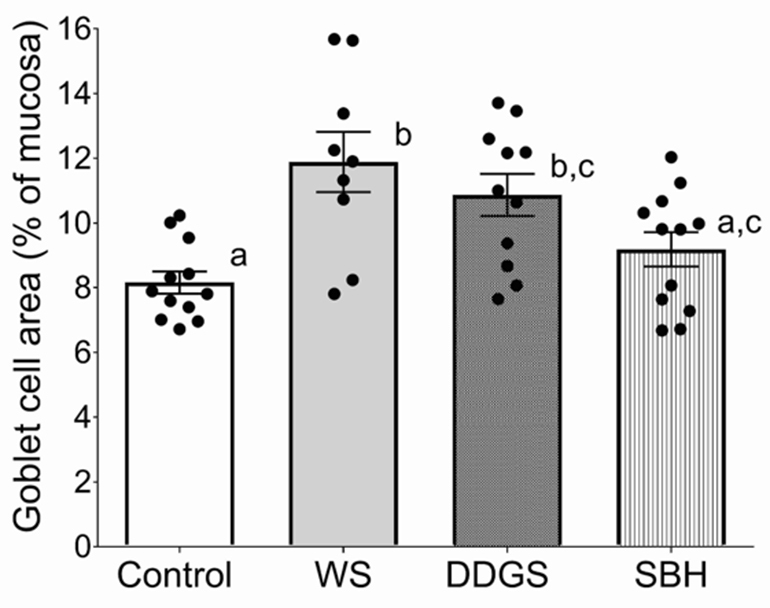 Feeding DDGS or WM increased mucin expression. Interestingly, supplementation with non-starch polysaccharide degrading enzymes reduced the effect of fiber. Although the mucin expression was increased, there was no change in the amount of goblet cells. Overall these data suggest that solubility and fermentability of fiber, their concentration in the diet and modifications by non-starch polysaccharide degrading enzymes impact mucin production and consequently may impact susceptibility of pigs to infectious diseases. It also suggests a potential impact of solubility and fermentability of fiber on endogenous losses of the amino acid threonine. The current swine National Research Council (2012) would suggest that greater intake of fermentable fiber would increase the requirement for threonine. The group at the University of Minnesota has not directly measured threonine losses of pigs in those studies. However, if expression of mucin and abundance of goblet cells are related to requirement of threonine, these observations suggest that a revision of the NRC calculations is needed. Figure 1: Area of ileum tissue that was covered by mucin producing cells (goblet cells). Values are the mean of eight observations; control was a corn and soybean meal diet, WS: diet with wheat straw, DDGS: distillers dried grains with solubles, and SBH: soybean hulls (Saqui-Salces et al., 2017, J Anim Sci 95:1179).